This cycle from Hukeng to Xiamen marks the final part of or ride through China. After two months of cycling (including breaks), we have ridden 2,254 km through three provinces. Becoming cyclists was not something we ever talked about in the past. The idea was Caroline’s and it came to her when we were still in Vietnam, looking to find a solution to the problem of how to get around China since we wouldn’t have a motorbike. We wanted (needed) something that still allowed us freedom of movement. So we bought some bicycles in Nanning, and rode them all the way to Xiamen with a brief break in Macau and Hong Kong. I’ve dedicated a whole page to the trip which can be found HERE. 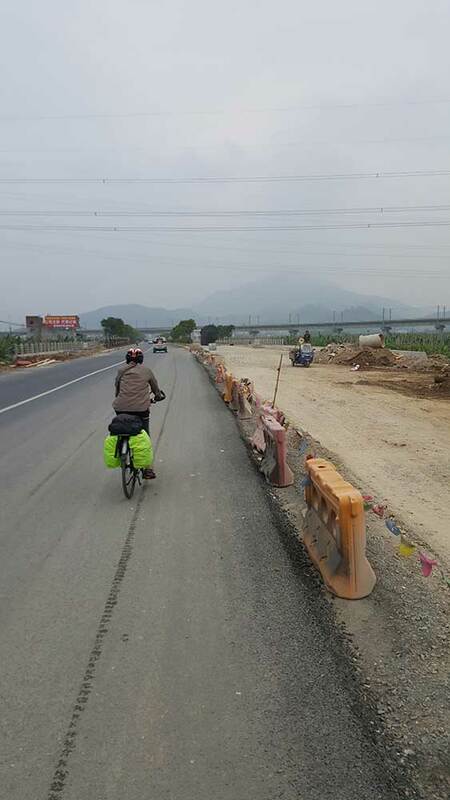 I actually thought this final diary from Hukeng to Xiamen would be a bit longer, but after the amazing time we spent cycling in the Fujian mountains, the three days it took to get back to the coast were a bit of an anti-climax. But the trip needs closure. Nope, not that Nanjing. A different one. This ride involved climbing and descending some pretty steep mountains. 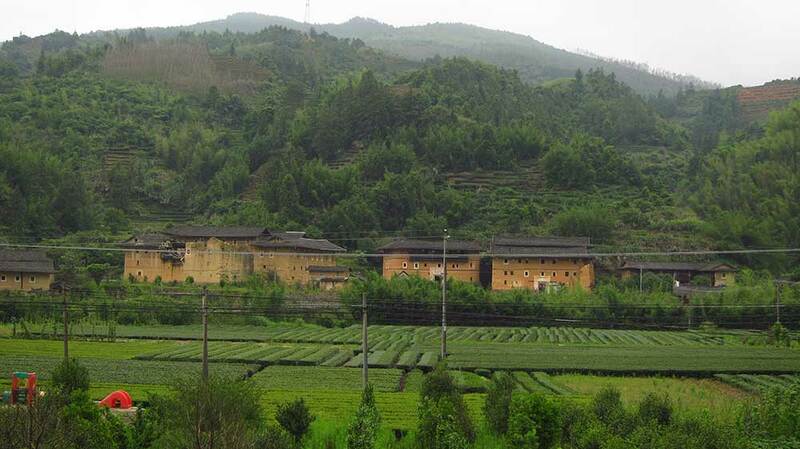 We passed a couple of famous tulou sites where teams of buses ferried hundreds of Chinese tourists to and fro. 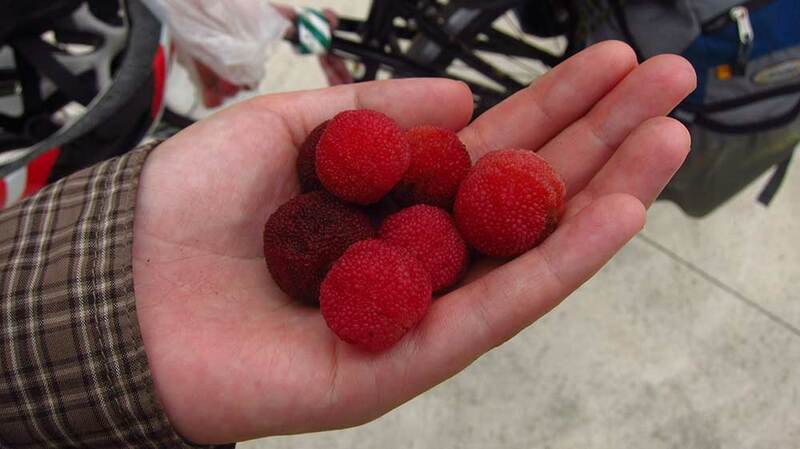 A few people in private cars were chased by sprinting tour guides, and carts sold hats, selfie sticks, and a kind of berry/fruit we’d never seen before called yangmei. Yangmei can only be found in small parts of East Asia, and is only available for about two weeks every year. They are kind of sweet and tart like cranberries and pomegranates, and have a pit inside. 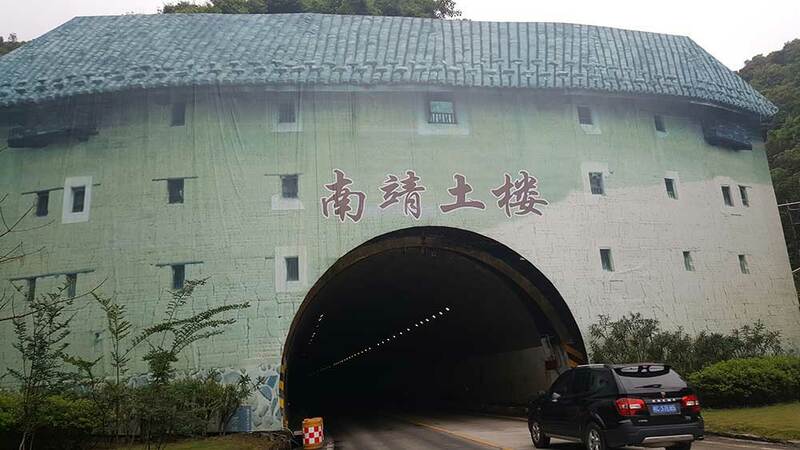 A very not subtle entrance to a tunnel. After this little tulou tourist fiesta the road took a steep turn in our favour, and we barreled down a hill for at least two tracks on my headphones. As we descended the mountains we were greeted by the haze. I’d almost forgotten about the thick layer of pollution blocking the horizon at sea-level, but here it was. The last 15 km to Nanjing followed a river. It would have been a pretty ride if not for the smokescreen. Not to be confused with the much larger capital of Jiangsu (which I did confuse it with), this Nanjing was a small city. 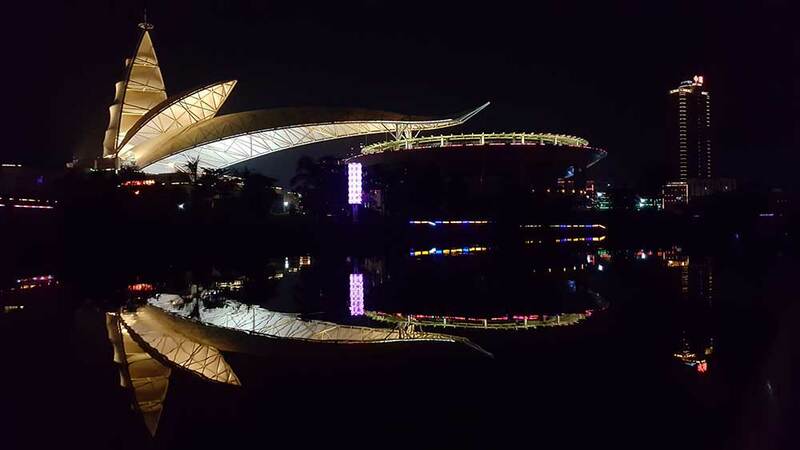 We took a daytime stroll and found not much more than clothing shops, and then we took a night time stroll joining hundreds of locals in their evening walk along the riverfront. 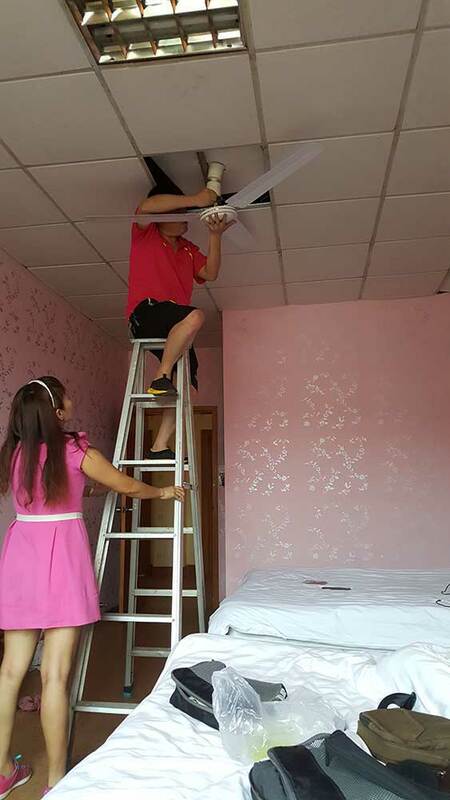 After we found a room, a repair man was sent to replace the fan. We’re not sure what this was, but I think it was mostly decorative. It was on its own island, and a lot of people were exercising around it. This ride was a kind of an endless industrial purgatory. The street we stayed on in Zhangzhou did have a lot of good food (and plenty of dessert), so it made up for the dreary ride. And thus: my shortest cycling diary entry for all of China. Hours of this kind of view. Considering it was our glorious arrival into Xiamen which signaled the end of our adventure, this day felt an awful lot like the last. The road was hazy and industrial. 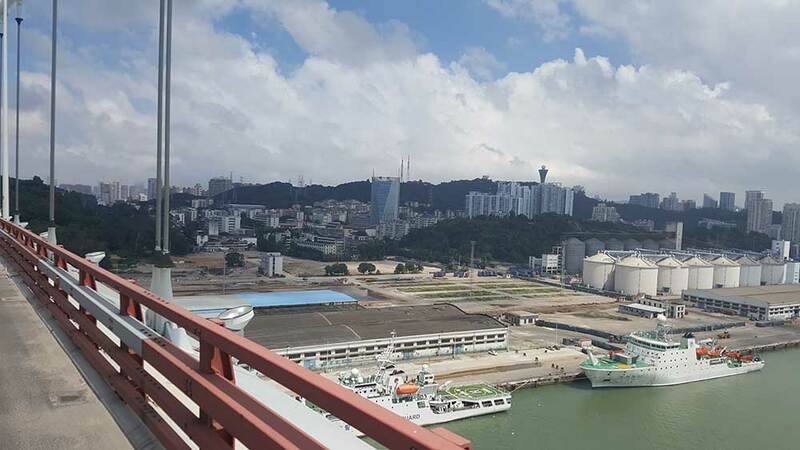 Thousands of trucks bound for the Xiamen ports hauled containers and kicked up dust, and whenever there were road works there were traffic jams as four lanes became two. 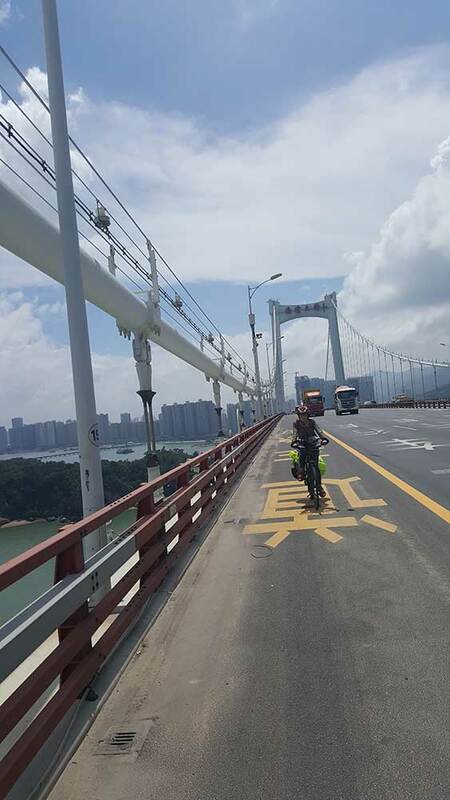 There was a detour as we neared the huge bridge leading to Xiamen Island, and this had us cycling through new developments and manicured parkways. When we eventually found our way to the bridge, we looked in horror at the signs that said ‘no bicycles’. Checking the map, the next bridge to Xiamen was 12 km away, and it would add almost 20 km extra to our ride to reach the same point on the other side. So we thought, “Screw it,” and just cycled over the car bridge. It was nerve wracking, but nobody seemed to care. A cop car passed us and didn’t do anything, and so we continued, managing to get a fantastic view of Xiamen from high up on the enormous suspension bridge. On the other side we were met with a very confusing spaghetti junction, but somehow we managed to find our way off it and onto a road that allowed bicycles once again. These photos were taken while moving. Our guesthouse was nestled just south of the botanic gardens. It was in an area popular with domestic tourists, and many of the houses had been converted into little hostels. Ours was hidden in what one reviewer on booking.com referred to as ‘a slum area’ that ‘isn’t for westerners.’ Obviously one person’s definition of a slum is different from another’s. We found the place to be a vibrant community with so many little restaurants everywhere that you could eat for months without having the same thing twice. It was food heaven, and we spent (well, would spend is more appropriate since I’m writing this from that very guesthouse) seven nights there (here). And there was an added bonus to our guesthouse: kittens! And so our cycling trip through China ended with kittens. What an end! Such industrial glory! Please be careful though, China has the second highest rate of rabies in the world, a common vector is stray animals or those that have interacted with them. 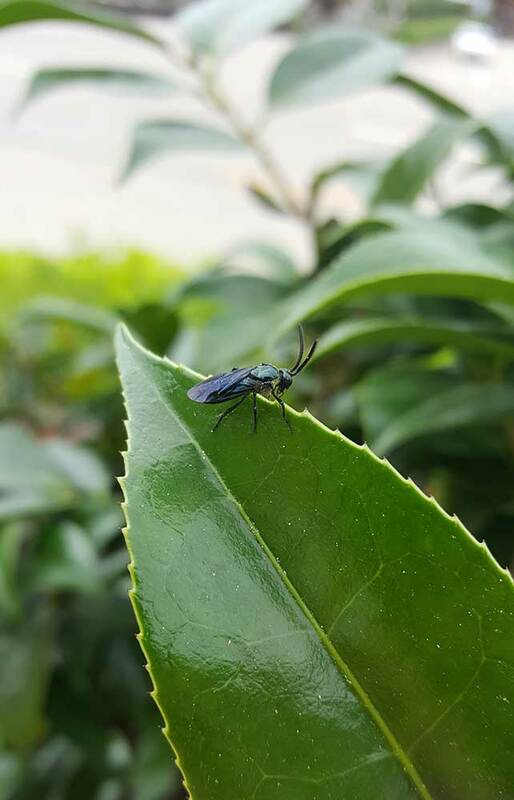 Having seen a number of rabid animals in China, it is a country that is common enough that you should probably not touch animals you don’t know. The SE of China is particularly bad for it! Very hard to recover from rabies, I believe the number of people who have recovered from it can be counted on 1 hand! Gulangyu is pretty nice worth a visit, Xiamen University and the nearby temple area plus mountain walks are pretty nice too. Don’t get the vegetarian food at the temple though, it will cost you like 100 kuai which includes a temple “contribution”. They practice an extremely corrupt form of buddhism out there, we saw many “monks” leaving to go back home in their BMW’s with their iPhones in hand! Not quite the more pure versions found in SE Asia/Tibet etc. Have fun, anticipating your Taiwan journals! 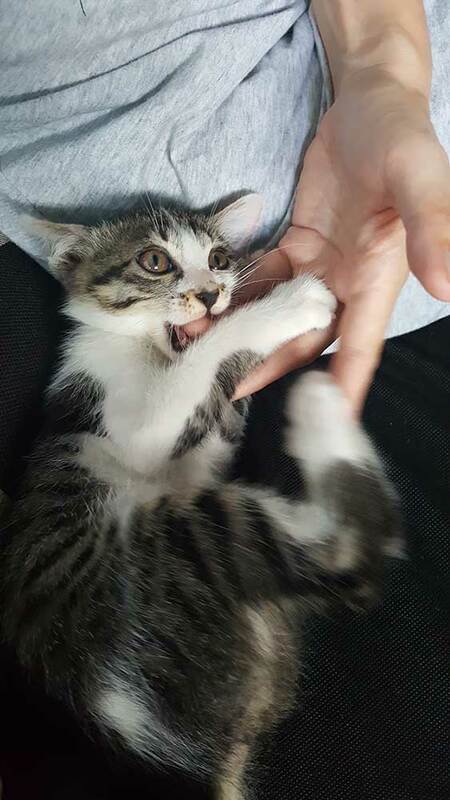 Don’t worry man, I’ve already got rabies and I can fully control it. We just saw a bunch of monks crossing the street today. Probably scheming. We met quite a few monks and learned a lot about Theravada Buddhism in Thailand and Myanmar (especially Myanmar), but I feel like I’ve learned nothing at all about the Chinese practices. They don’t seem to be as open to sharing here, and often temple gates are closed. Cheers, Brent. It feels like you’ve been cycling alongside us in spirit!